It appears from this small sample that Australians still have in there minds the traditions of the holly, candles, doves and trees type Christmas which has been passed down to them by their ancestors most of whom migrated from the northern hemisphere. 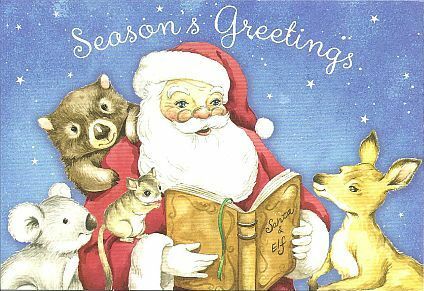 The above was written, and modified, over many years but in December 2018 we discovered in our local $2.00 shop the below range of Australian Christmas cards. Ten cards in a pack with five different desings all for $2. Penguins only live on the Antarctic continent & southern coasts of Australia. Doctor Santa Claus caring for a tired kangaroo while two reindeer carry the stretcher. 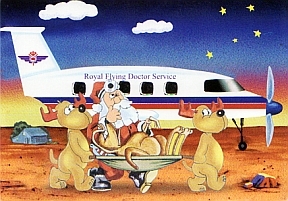 Card design by the Royal Flying Doctor Service. The Royal Flying Doctor Service of Australia is a not-for-profit charitable service providing aeromedical emergency and primary health care services together with communication and education assistance to people who live, work and travel in regional and remote Australia. In December 2008 we received the Christmas card shown on the right. 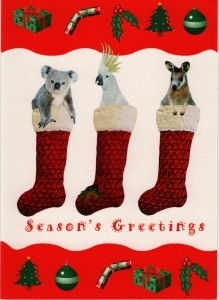 It depicts three creatures which are uniquely Australia, but then is framed with Christmas symbols from the northern hemisphere. The holly and the green fir tree are not common to Australia. The colours are mainly red, green and white which are world wide traditional Christmas colours. 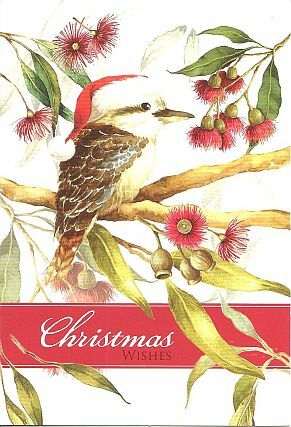 In December 2009 a quick search of the Christmas cards received revealed few with Australian themes. 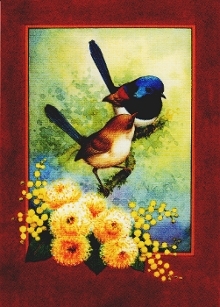 The birds are from the Australian Wren family plus Golden Wattle and Banksia flowers. The card was issued by Australian Red Cross. 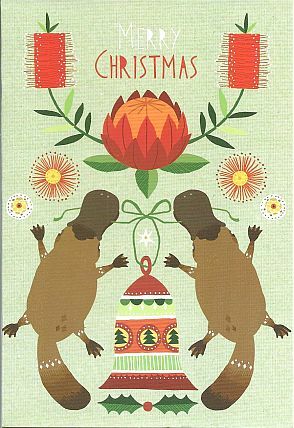 This card is by Sylvia Bremner. 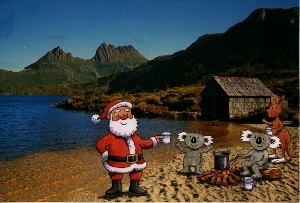 It is a photo of Cradle Mountain and Dove Lake with Santa and Australian helpers inserted. 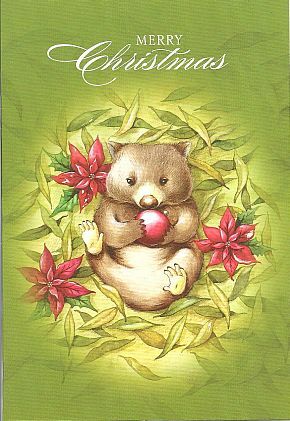 December 2010 this nice Australian theme card arrived. 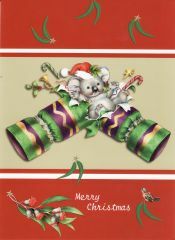 It was designed by Lee Krutop and depicts a koala exploding from a Christmas cracker. It is complimented with gum leaves and an Australian bird. 1st December 2011 - The first two cards received this year both had Australian themes. 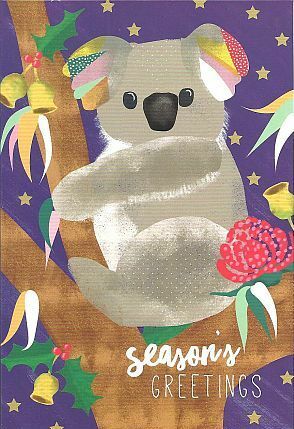 December 2014 we received the below card, with an Australian theme designed by Lee Krutop . 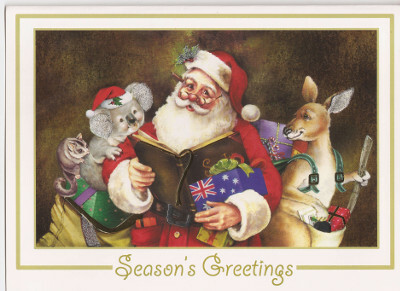 It is a very homely card featuring Santa, a kangaroo, a koala, a possum and the Australian flag. Beyond The Black Stump"is an Australian expression which means "remoteness". It generally indicates something is a long way away and in the middle of nowhere. Save this page in your Favourites folder, bookmarking it for use next Christmas.